CSR Plant Operator cards cover a wide range of construction plant and equipment. All candidates are required to complete the CSR 1 Day Health & Safety Training. All candidates are also required to complete the Construction Awards Alliance (CAA) Plant Award/Certificate. A profiling exercise is completed by the Training Provider to determine prior experience and ability and to assess whether the candidate requires training. If training is required the CSR Training Provider will deliver the necessary training. Red Trained Operator cards cannot be renewed. 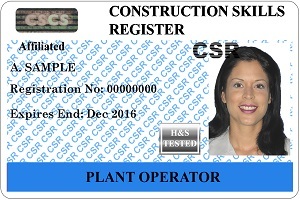 This is to ensure the progression towards a Blue ‘Plant Operator’ card within 3 years. All candidates are required to complete the CSR 1 Day Health & Safety Training and Operative Touch Screen Test. The candidate must achieve NVQ 2 in Plant Operations and must record a minimum of 300 hours operating experience on each category in the CSR logbook. Candidates who cannot record 300 hours will be able to complete a site assessment in its place. A Blue Plant Operator Card will not be issued unless six months has passed from the time of issue of the Red Trained Plant Operator Card, and the Operative Touch Screen Health and Safety Test has been passed within two years of the application date. Confirmation of 300 hours experience in each category of plant provided through CSR log book or employer declaration. Where confirmation is not available a technical test delivered by a CSR Plant Scheme provider is required.